City Owl Press, 9781944728793, 362pp. Join Alice. Private Investigator of the Supernatural. It has been a rough month for mage private investigator Alice Worth. Alice hasn't had a decent night's sleep in weeks, her relationship with werewolf Sean Maclin is on the rocks, a federal agent hounds her every step, and a powerful vampire whose ulterior motives have ulterior motives watches her every move. It's enough to drive any woman to drink. Just when Alice's ghost sidekick Malcolm is about to stage an intervention, her former employer, Mark Dunlap, enlists her help to find out who's been kidnapping women off the streets. As the list of the missing grows, the city's anger turns against the vampires, and the Vampire Court hires Mark and Alice to find those responsible. After the case reunites her with Sean, Alice is forced to confront painful demons from her past, as well as the very real demon who wants her dead and the vampire determined to control her power. When tragedy strikes close to home and a friend's life hangs in the balance, Alice goes up against the most powerful adversary she's ever faced in an explosive showdown that will leave Alice and her city forever changed. A: I've wanted to be a writer since I was five years old and I wrote my first story. My head is always full of stories and it's so wonderful and such a privilege to get to share them with others. I write because I *have* to write and because there's nothing I love to do more. When you write, you get to bring people to life, create a world for them to inhabit, and invite readers to enjoy that world with you. If that's not real magic, I don't know what is. A: I want to write the kinds of stories and books that I love to read--lots of adventure, mystery, suspense, action, twists, magic, and of course romance. 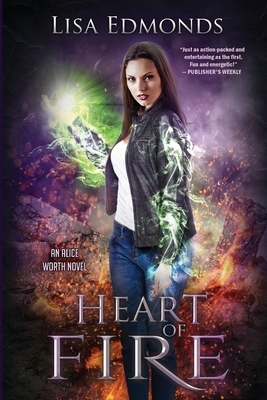 The Alice Worth series is paranormal mystery set in a world very like our own, but with magic and supernatural beings. I hope readers get caught up in the mysteries and enjoy going on adventures with Alice as she tries to solve them and figure out her place in the world. The reading order follows below. Q: Do you use music in your writing?